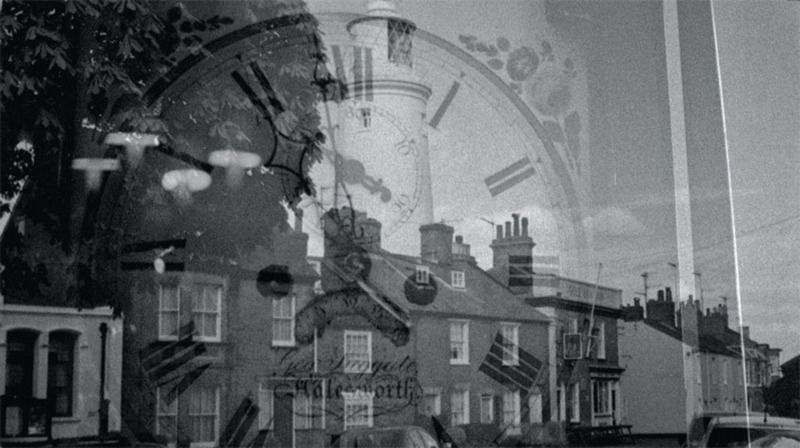 Grant Gee, Patience (After Sebald), 2011, stills from a black-and-white and color HD video, 82 minutes. W. G. SEBALD’S UNCLASSIFIABLE BOOK The Rings of Saturn (1995) begins with its aftermath. The writer takes a series of long walks through the Suffolk countryside and along the coast and then becomes ill, almost unable to move. He recovers in a hospital in Norwich, amid various bad omens, such as the abrupt, unexplained deaths of friends, and writes his book, now cautiously associating his medical condition (“perhaps it was because of this”) with “the paralysing horror” that had overcome him during his walks when he was repeatedly “confronted with the traces of destruction,” learning the lesson that “our history . . . is but a long account of calamities.” The sequence of events is indisputable even if the causality is in question, but we are at liberty to think The Rings of Saturn offers other experiences and lessons to us beyond its dark orchestrations of disaster. If Sebald thinks constantly about destruction, he also shows us its constant traces, so that his book becomes an act of material remembering. He looks at soil, trees, sea, houses, graveyards, technologies, ruins; tells the stories of the people who lived among these things, the stories of the faraway places those people thought aboutand he tells the quite different stories he himself conjures up as he is walking and resting. This is how we get to China, Ireland, the Netherlands, Germany, Serbia, without ever leaving Suffolk. Remembering as Sebald practices it, combining location with local history and local history with far-reaching acts of research and not quite free association, takes us well beyond disaster and loss. If remembrance can’t undo destruction, it can keep it so vividly in our minds as to rob it of any chance of wrapping up its supposed business. Grant Gee’s new film, Patience (After Sebald)which documents the British filmmaker’s retracing of Sebald’s walks in Suffolkfeels a little longer than it is (82 minutes), in part because one or two of the persons interviewed are allowed to state the obvious at considerable length, but mainly because, as its title suggests, slowness is part of its aim and attraction. It’s a work that seeks to do several things at once: first off, to tell us who Sebald was and what preoccupied him, to introduce us to the world of this book and take us through its pages more or less sequentially. This all needs doing, but only as a basis for what the film is actually up to. It is not out chiefly to supply information or illustration, and it is not even in any simple sense “about” The Rings of Saturn. It is about the experience of reading The Rings of Saturn, which includes seeing the physical book, looking at its text (often at a slant, half in shade), pausing over its pictures, hearing it read aloud, listening to readers and writers talk about it, listening to Sebald discuss it, seeing some of its locations as shot by a movie camera, glimpsing Sebald’s world as it may have looked to him and certainly looks now when he is gone. (He died in 2001.) His grave gets a small cameo. All this is “after Sebald” in an interesting triple sense: later than him, according to him, and pursuing him. In the same way, the film’s subtitle, “A Walk Through The Rings of Saturn,” is scarcely on the screen before it takes off into metaphor. We have heard the sound of cars, and now we see a train pull out of a station. It’s that kind of a walk: one that includes rides. And of course, although the physical walk is essential to the gestation of the book, Sebald’s mind was not walking through Suffolkit was levitating, hovering, squatting, digging, despairing, speculating, and much more. The departing train is also a reminder, in case we needed it, that we can’t walk through a book, and a film can’t be a walk, even if it can be almost anything else. Patience has all kinds of interesting angles and moments, but four in particular come to define it: Two are individual sequences, and two run through the whole work. In the book, Sebald launches one of his historical excursions from the slender platform of a newspaper he happens to be reading on the day he is talking about. The story concerns the mass executions carried out by Croats, Austrians, and Germans in Bosnia at the end of World War II. In the film, Dan Gretton, the author of a forthcoming study of the Holocaust’s bureaucratic enablers titled The Desk Killer, describes Sebald’s summary of these events but adds an amazed, admiring tone of his own, along with the information that the “young Viennese lawyer” who drew up the documents for the resettlement of survivors was Kurt Waldheim, identified by Sebald only as someone who later became secretary-general of the United Nations. The film abruptly leaves its duplication of the book’s grainy picture of dismembered bodies hanging on a pole and shows us a space probe approaching a distant planet. What is this? Well, Waldheim in his UN role sent a taped message to the universe aboard Voyager 2, and the film for good measure plays us the tape over the colored images from space. This breaks Sebald’s rule of working only “obliquely, tangentially,” as he describes his approach elsewhere on the sound track, but the effect is also quite different from anything print could manage. This is not a documentary gesture, a bit of backup to the story. It is the summoning of a voice from the gravecivilized, courtly, speaking Austrian-accented English (that’s what they’ll talk in space, whoever “they” are)the summoning of the real voice of a man who knew quite a lot about graves. Borrowing an idea from Peter Greenaway, the artist Jeremy Millar decides to set off a firework in memory of Sebald at the place where he died and to photograph the smoke. We see the photographs, in color, and then Gee gradually pulls up an image of Sebald himself through the smoke, drooping mustache, sorrowful countenance, and all, the twigs and branches of the actual trees behind him still showing like scratches. Then the image fades, leaving us only with the smoke. If Waldheim’s voice reminds us of what a man has said and not saidthe poet David Lehman, writing about Paul de Man, once invented an ailment called Waldheimer’s disease, an affliction that renders its sufferer incapable of recalling his Nazi pastthis smoky picture, an evocation of the style of Sebald’s remembering as much as a memorial to the man, suggests that a dead person could come back at any time, and that this one will come back every time this film is shown. Come back and fade away again. The two more continuous elements are visual and aural. The first is the recurring landscapeit feels as if there is only one, but there are many with the same tonalityin which the sky plays the preponderant part, often taking up more than half the screen. Beneath it there is sea, or there are trees or houses, but all flattened, uniform. These shots are in black-and-white and held for quite some time, leaving us with our thoughts and what seems like nothing to look at. There is something incredibly beautiful about these frames, and about the fact that they are moving pictures in which nothing moves, as distinct from photographs, in which nothing can move. They suggest not that the world is empty but that it is full of stuff we can’t see, however hard we stare. The psychoanalyst and literary critic Adam Phillips, discussing melancholy in the film, says it involves the feeling of “some catastrophe that can’t be located,” which seems odd in relation to Sebald, who is so adept at convoking the precise contours of all kinds of horrors. But Phillips, and the film, is right about the larger mood. The real catastrophe is, perhaps, the one we can’t name or find but also can’t ignore. And, finally, there is the wonderful reading by Jonathan Pryce of many passages from Sebald’s text. We hear Sebald’s voice in the film toodeep, fluent, with an accent distantly related to Waldheim’sand I don’t know whether Gee chose to have Pryce read the text because there wasn’t a recording by Sebald himself. Whatever the reason, the result is wonderful. There is the voice of the author himself, and then there is the voice of the book, which turns out to be different. This second voice also belongs to Sebald, because he wrote the words (or at least wrote the German words his translator, Michael Hulse, turned into English); to Pryce, because the accent and intonations are his; and to us, because we are reading along, making our own the voice we hear. I’m making this sound more complicated than it is, but not, I hope, more magical than it is. The author is dead, twice: literally and because he seems to have disappeared into his text. But he hasn’t disappeared into his text. He has become his text, which is different, and only an extraordinary actor could, as Pryce does, so thoroughly reanimate a real person and stay so subtly out of the way. Grant Gee’s Patience (After Sebald), which made its US debut at the New York Film Festival this past October, opens at Film Forum in New York on May 9. Michael Wood is the author, most recently, of Yeats and Violence (2010) and Film: A Very Short Introduction (2012; both Oxford University Press).